There are multiple ways to rig big live bait. Ask 100 people and you’ll be lucky if you get 99 different techniques. Below some tried and true methods of rigging big live bait. If you know of a technique we didn’t cover below feel free to drop us a line on the Contact page. The most common rigging method in areas with high fish concentrations is just putting a hook straight into the bait. Common hooking points are under the dorsal fin, through the nostrils, through the lips or through the shoulders. Hooking the bait directly is quick & easy and requires no special tools, floss or rigging needle. The drawback is that bait hooked directly often does not live as long as bridled bait. Also, hooked bait does not normally troll as straight as a bridled bait. Multiple bridling systems and techniques are available. Whether using heavy floss, rubber bands or metal clips the concept is the same. The idea is generally put a small hole through the bait and use floss or rubber band to attach the bait to the larger diameter circle hook. The circle hook is free of interference of the bait which leads to more hookups. The small hole made in the bait is minimally invasive and some baits will troll for hours and still be very lively. The drawback of bridling is the time and skill it takes. Lets be honest, running a 6″ needle through a flopping baits eye socket on a wet pitching deck is not exactly childs play. But the results speak for themselves. Bridling is the preferred method of many tournament anglers worldwide. If you are new to bridling we highly recommend picking up a Bridle Buddy to help make life easier. Eyes: When hooked/bridled through the eyes a trolled bait will troll straight and generally stay near the surface. Shoulders: When hooked/bridled through the shoulders a trolled bait will troll straight and generally stay deeper than an eye trolled bait. The bait will have a tendency to swim deeper. Back: When hooked/bridled through the back a trolled bait will spin and quickly die. Baits are generally hooked through the back when drifting or at anchor. A back hooked/bridled bait will have a tendency to swim away from the rod tip. If the bait begins swimming back to the boat, you can just take up slack tor turn the bait away from the boat, then release some line so the bait can swim away. 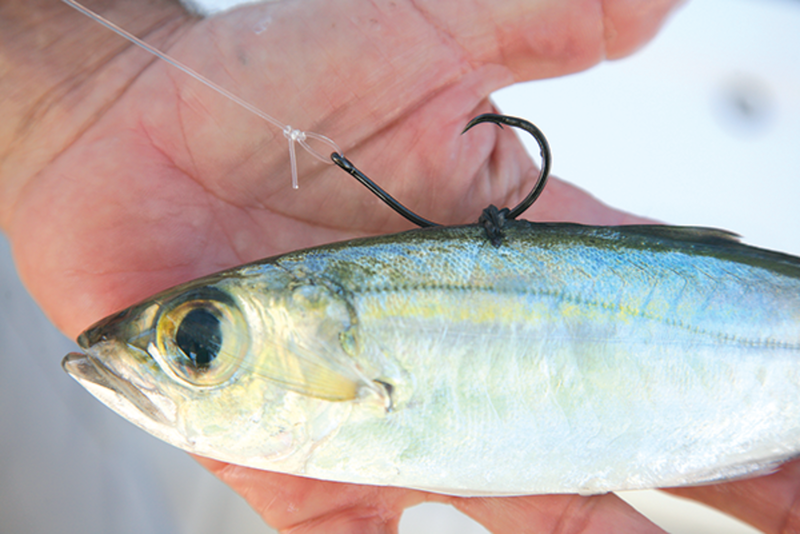 Back hooked baits often resemble a very injured baitfish and are hard for predators to resist! 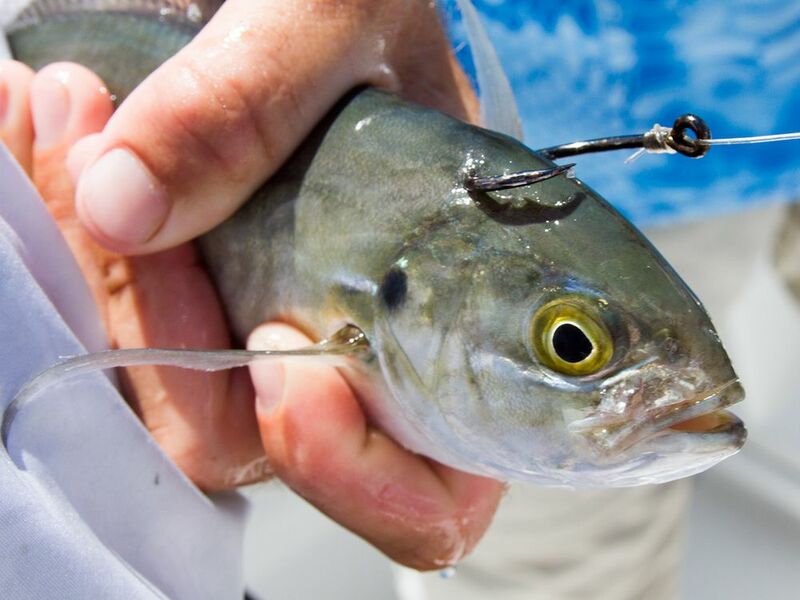 Toothy Critters: When a toothy species like King Mackerel or Wahoo is the target you will want to use a wire leader. There are various ways to rig both single strand and multi-strand wire with hooks for trolling and free-lining. 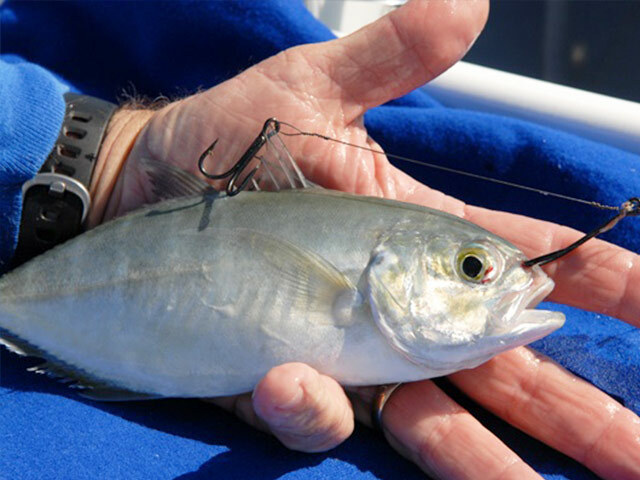 The most common rig employs a thin wire live bait hook in front with one or two treble hook stingers.